DigiStamp Boutique has some new images available now. 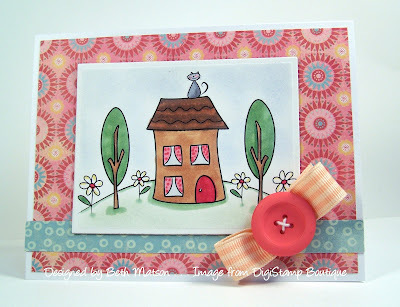 One of my favorite new images is this cute little house with the kitty perched on the roof. I colored the image with Copics then added some K & Company Wild Raspberry papers, ribbon and a button. Thanks so much for stopping by. I hope you're having a wonderful Monday!